Babies and general men, prepare for a journey into the lives of your favorite group of toddlers in Rugrats, Season 6! Join the babies as they attend a wedding, get trapped at the zoo and visit an art museum! Witness their endless imaginations as the babies pretend they're in a Reptar movie and Tommy thinks he's turning into a monster. Then, the babies dream they're small but Dil is huge, Chuckie ruins his iconic shirt and studies street safety! Plus, Angelica tells Tommy he will disappear when Dil gets all his toys, and Tommy worries that they'll stay babies forever if they don't stop sucking their thumbs. 3.7/5 Stars from 4 users. 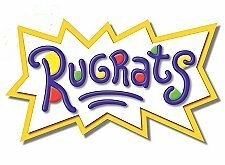 Please give the Cartoon Series Rugrats a vote between 1 and five stars, with five stars being the best, 1 being a show you absolutely hate, and a three for an average show. This Series has been viewed 4 times this month, and 10,330 times total. Rugrats Episode Guide -Klasky Csupo @ BCDB by Big Cartoon DataBase is licensed under a Creative Commons Attribution-NonCommercial-ShareAlike 4.0 International License.